Two days after I made settlement on my new home, I climbed over the boxes and left for vacation. The trip had been planned and paid for long before my other house sold, so even though the timing was crazy, it seemed the best thing to do. And, boy, I am so glad I did. Long a lover of coastal views and lighthouses, I never knew how beautiful both could be when sweeping mountains meet the salt air . It is a true meeting of the natures's masses and I was mesmerized from day one! Sweet, fresh lobster, mayo and celery! So good! Add this to the fact that I was also in search of the perfect lobster roll! I had heard about them, I had seen pictures of them, I have (sorry to say) dreamed about them from the moment we plotted our course north. And although I thought I had a pretty good one in a New Jersey restaurant, the people of Maine assured me that I had not. If you want a great tomato, stay in Jersey. If you want a juicy grapefruit, go to Florida. 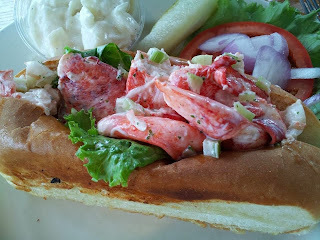 But if you want a true buttery, sweet and succulent lobster roll, go to Maine. And so we did. 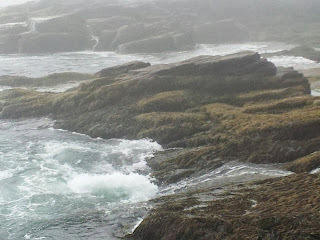 First, it must be noted that spending a couple days in the beautiful Acadia National Park does wonders for the soul. It puts your life, in the main scheme of things, in perspective. 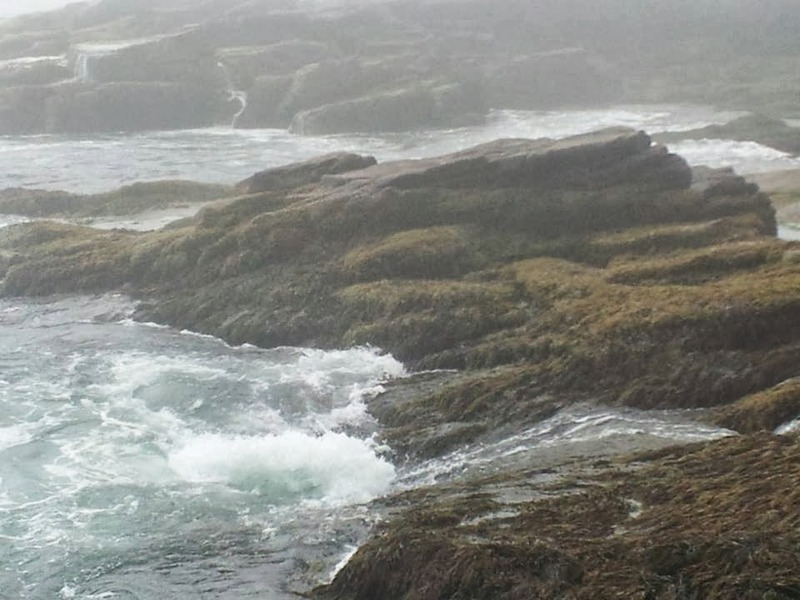 It is hard not to sit on a rock, way above the waves crashing on shore and not think of such things. With each slow breath, the ragged edges of a rough year began to smooth and I was grateful to witness what has to be some sort of master plan. That said, hiking makes you hungry! So back to our quest! Now, you might think that the most important ingredient in a lobster roll would be lobster, right? Well, yes and no, because equally as important is the roll. 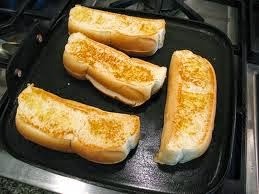 It has to be, must be, a New England style hot dog roll with no crust and split on the top. Right before adding the lobster mixture it is buttered and grilled and amazing. HAS TO BE THIS ROLL!! 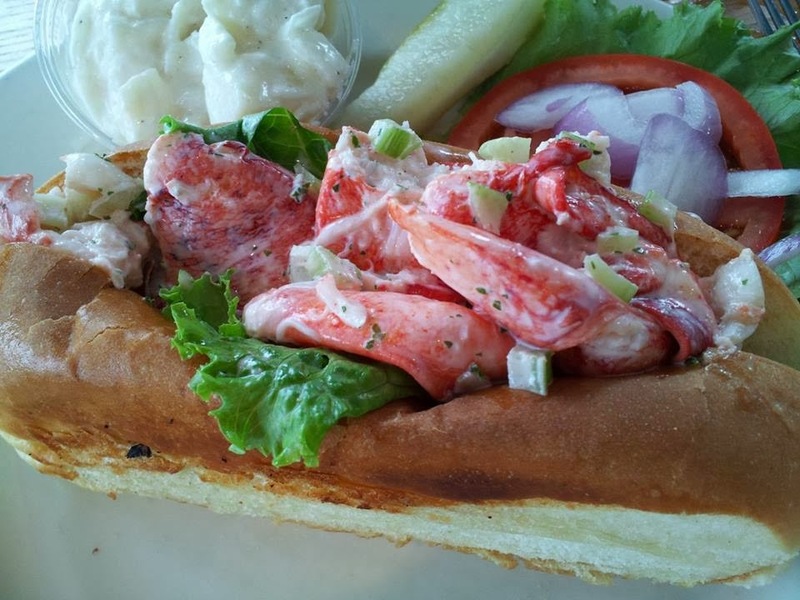 The mixture that makes a lobster roll can vary from place to place. The three main ingredients are lobster, mayonnaise (just a small amount of mayo is perfect) and chopped celery. My personal favorite had a pop of Old Bay as well, but others added a hint of tarragon, or chopped tomatoes, chopped onion or, as most did, a slight squeeze of fresh lemon right before serving in warm, buttery roll. 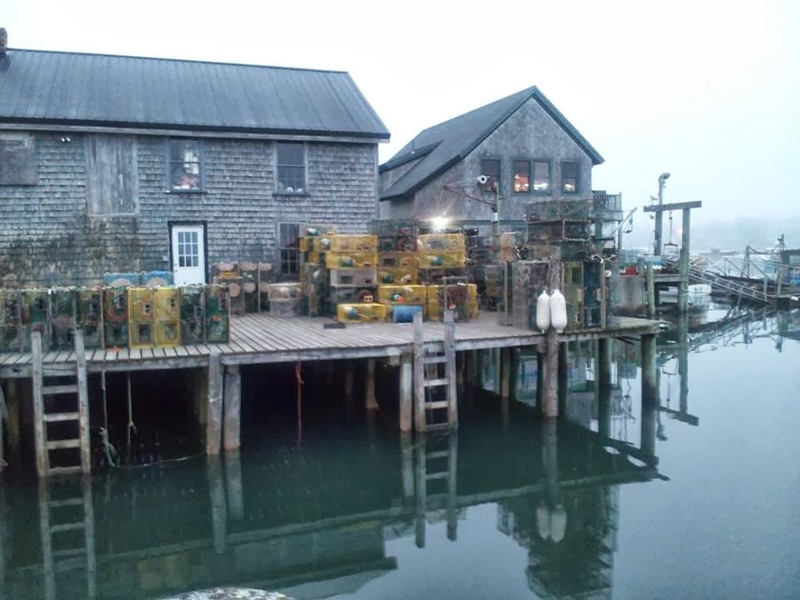 The popular hunt for the perfect version of this tourist favorite is evident when riding through many of Maine's small towns, as most roadside stands, some with boats docked behind, all claim "Best Lobster Roll in Maine Served Here"! I think what I loved most about dining out in Maine was that there is nothing fancy or pretentious about most restaurants. In fact, old clothes are best for pulling up to a paper covered table where lobster juice and butter are sure to join forces below your bib. Other notables are the wonderfully large and oh, so sweet, bay scallops and shrimp. Okay! 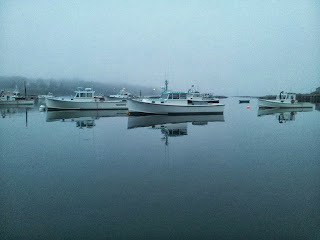 So seafood in Maine is abundant, fresh, and wonderful! Let's go ashore for this northern states other claim to fame...the popover. If you are ever in,or near, Acadia National Park, a stop at Jordan's Pond Restaurant should be mandatory. You won't even have to order a popover, they will bring one for each person seated at the table. It will be served warm from a basket covered in cloth and served with a side of honey-butter. It is both decadent and airy. Their recipe can be found on the internet and I suggest you look for it. The hardest thing about making it is finding a popover tin. They are much deeper than muffin pans and absolutely necessary for baking them. With the holidays coming up, the aroma in the morning will be a great way to surprise your overnight guests! I will end with one more fabulous find in Maine. 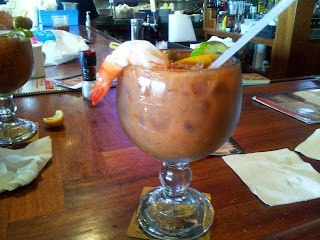 Bloody Mary's are a passion of mine when traveling. My friends, Karen, Pam and I have consumed and rated them around the world. So far, a small bar on Fisherman's Warf in San Francisco holds the number one spot. 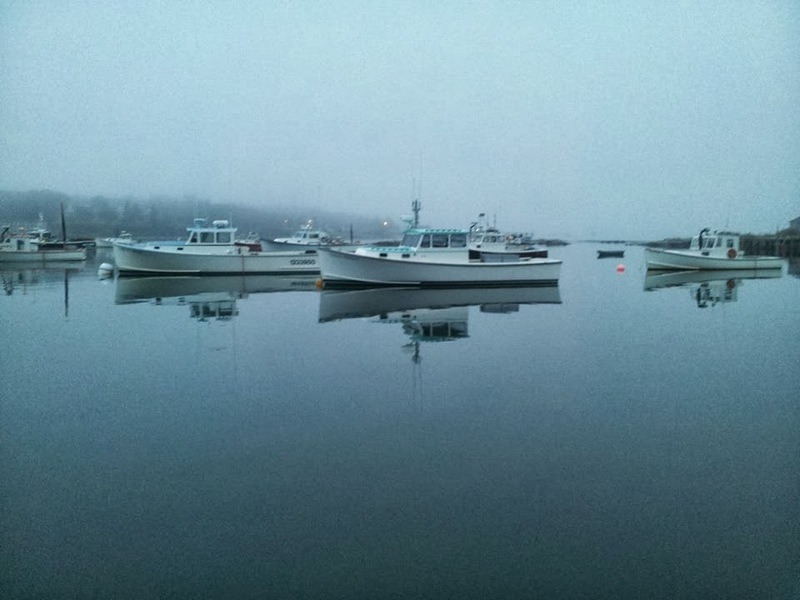 But the Bar Harbor Grill, situated on the mouth of a massive inlet, has now moved into second place. Spicy, with olives and shrimp, lemons and limes, this was a true masterpiece! Had they rimmed it with Old Bay, it may have knocked its West Coast rival from the number one spot! Small business owners are brave warriors in today's world. Surviving in the shadows of large conglomerates and established franchises is not just tough, it can be down-right intimidating. Once knocked down, it is easily understood why small, independent entrepreneurs pick up their stools and leave the ring. 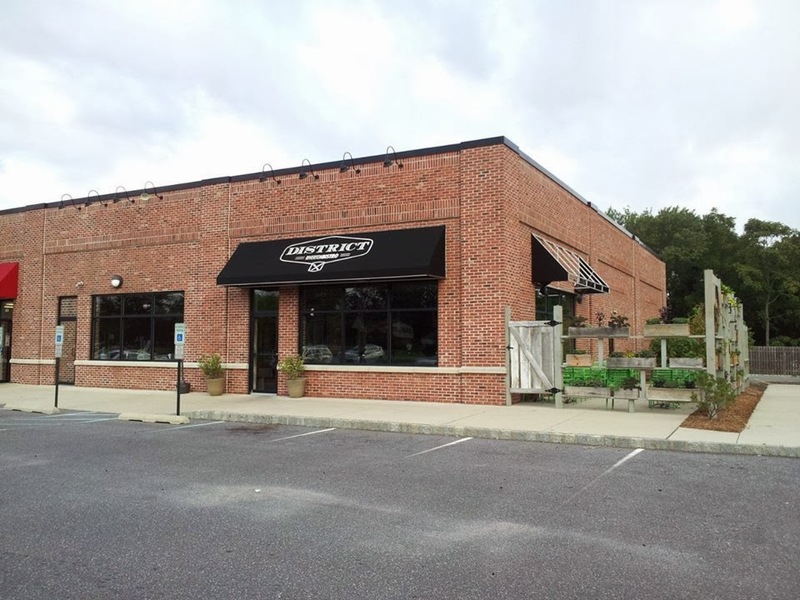 That's why it is so refreshing to see someone like Jim Brandenburger who's restaurant District 611 closed less then a year after opening in Riverton NJ, put the gloves back on, re-do the menu, chef and staff, and seemingly say "okay, let's go another round". And judging by a recent visit, this time he could easily score a knockout! Jim and wife, Janet, have teamed with top notch talent by bringing in established restaurant business manager Ken Merrimen, and former Le Bec Fin Chef, Dan Maher. To help make the District more "family friendly" then it's predecessor, a second wood burning pizza oven was installed to help alleviate weekend backups. And while a more traditional style pizza is now available, Maher used his CIA training to keep and enhance popular 611 versions such as the "Little Italy" (a personal favorite) with prosciutto, arugula, figs and a balsamic drizzle over mozzarella cheese, along with an Italian Sausage Broccoli Rabe pizza that is aimed to please a a more sophisticated palate. It hits the target. Another change to the menu is the "Cozy Comfort" section which was honed to bring home-style meals to those seeking more traditional fare. And to be honest, with pricing competitive with most local diners, the flavors are still off the chart on such standards as "Country Meatloaf" and Chicken Pot Pie. I spoke to one local business person who ordered the meatloaf and mashed potatoes, and then proclaimed it "the best meatloaf I ever had in my life. And at my age, that is saying something"! The pot pie is amazing with a light and flaky pastry covering fresh chicken in a white wine and Dijon gravy with vegetables. It just doesn't get any better. "Most decent restaurants can pull in customers on a Friday and Saturday," explained Chef Dan, "we needed to create dishes that will bring them in on Tuesdays, Wednesdays and Thursdays as well." The concept of homemade favorites (with a gourmet flare) at a great price, may just be the ticket for those looking for relief during a busy work week. But for those looking to reward kicked-up culinary expectations, the entree section of the menu is where to focus attention. With choices like the "Sirloin Tower", "Jumbo Lump Crab Cakes", and "Stuffed French Cut Chicken" with figs and blue cheese in a Port Wine demi sauce, it is hard to choose. My dining partner and I went with the latter two and then agreed to share the large portions so we could sample other selections. And although after one bite we both were reluctant to surrender portions of either choice, I'm glad we did. It quickly became apparent that this chef is a true culinary master. The appetizers such as "Warm Ricotta Flat Bread" made with homemade lemon ricotta cheese, a cheese board, chicken wings and (are your ready for something different?) pig wings, cooked in a spicy Thai sauce, alone are worth stopping by for. Riverton, a small town with large Victorian style homes nestled along the Delaware River, is a great destination for any reason. In fact, two years ago, Travel Magazine voted it as one of the best small towns to visit on the Forth of July. The renovation of style and menu at the District, is one more reason to get in the car and head towards the river. "We want to be the place that anyone can come to relax and mingle with neighbors and friends while having a really good meal." said Brandenburger. With a softened interior, a new outdoor seating section and menu that appeals to everyones palate, this BYOB could be just that! Do-overs are never easy, but it is obvious that a lot of effort and thought went into restructuring this dining experience. It deserves a second chance. Floor install not finished, but starting to look like home! Initially, I felt the smartest thing to do would be to find an apartment, settle in and ride out the emotional storm I was going through. Unfortunately, the transition from a large Colonial house to a small (and relatively expensive) apartment was a much harder transition then I expected. Nothing seemed appealing. Each afternoon I would set my sights on a different complex full of hope, only to come out dejected and depressed. One final search broke a standing resolve I made to myself to never to shed tears during the daytime, when I rested my head on the steering wheel and cried, "I can't do this." I need a real home. I need a place that is the central homestead for my family. A place to entertain my friends. A place I can do what I want, when I want. It became apparent that an apartment, no matter how large or modern, wasn't going to do it for me. Step in, my sister Betty, the Realtor! Bring in South Africa! After several attempts to find something in my price range and likability, a condo unit less than a mile from where I lived came online at more than $20,000 under market value and well within my budget. Betty immediately set up an appointment and that afternoon we set out to change my life When we pulled into the community, it was apparent that it was a well kept 55+ development, with manicured landscape and flowers in hanging baskets . When we walked into the unit, it was apparent why it was selling under market value. A lovely, elderly Brazilian couple had spent a great deal of time in South Africa and when they moved to America, they attempted to bring the motif with them. Jungle green walls were decorated with masks and spears. Large paintings of tribal dancers in full regale lined the walls (even in the bathrooms). The large living room lamps were carved replicas of a lion on one side of three couches and a tiger on the other. A second floor unit, I stopped when I got to the top of the stairs in total wonderment. My sister, came up behind me and whispered "we will paint it" as she went around and extended her hand to the owners. As she was making the introductions, I was standing still so not to be in the way when Tarzan swung through the room. I was actually about to start back down the steps when I heard Betty say "yes, please show us the rest of the house." I will admit to not having a designers eye. The price and location were perfect but the decor scared the hell out of me. Quite frankly, I didn't know if I had the energy for what this house needed. But Betty and others convinced me that with $20,000 in instant equity, a little money, sweat and paint was all that was needed to make this a sound investment...and a place of my own! So I bought it. When final walk through occurred before settlement, I was relived to see that with the jungle decor and furniture gone, all it really did need was new flooring, paint and some cosmetic updates. This could be the perfect place for me after all! A nice neighborhood close to my sons, my girls, my sisters and my friends, all who have been so supportive...how could I not make every effort to bring it all home! 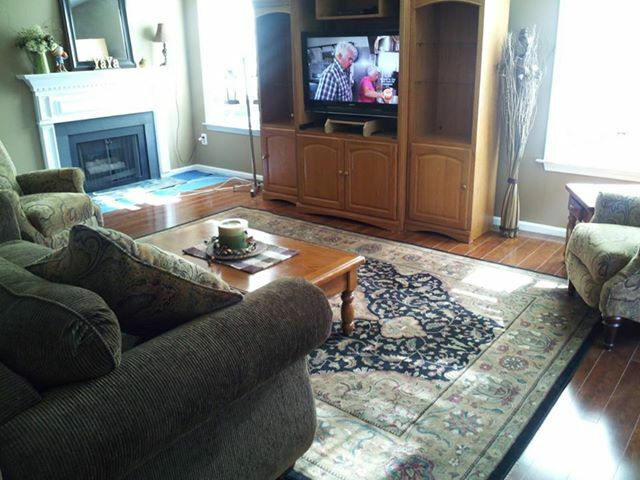 At this post, most of the wood flooring is down and most of the paint it up. Still much to do but already loving it. One glitch has been some internet issues that are being worked on. Once resolved, many pictures will follow. And now, after re-reading this, I'm off to the local improvement store for more paint...and a plunger. Check back! My Grandmother, Ninth Street...And Rocky! Note: The following is a re-post of one of Kitchen Clatter's most popular blogs. It was picked up by a local paper which then started a Tomato Pie craze! Next week? Celebrate Autumn with a new post from an all new Kitchen Clatter. Please stop by and pull a chair up to the table! 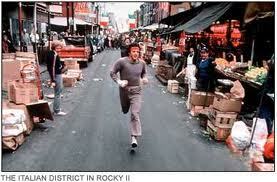 There is a scene in the first Rocky movie where the fighter in training runs down the middle of the 9th Street Italian Market in Philadelphia, and one of the fruit vendors throws him an orange. I thought about that recently as I walked down 9th St. recently. That was 37 years ago, and while there are many more vendors from other country's here now, the concept has not changed from when my grandmother, an Italian immigrant, shopped here over 50 years ago. The market, in the heart of South Philly, was actually formed in the late 1800’s, as masses of Italian laborers migrated from Italy to work in the shipyards and factories along the Delaware River. Sadly, most, if not all, of those jobs are gone now, but the market of vendors, who sell produce from wooden carts on wheels, and line the street in front of butcher shops, bakery's, cheese and spice merchants, remains as vibrant as ever. While many other immigrant nationalities have joined the ranks now, its roots remain Italian. This is still a neighborhood where pasta sauce is simply known only as “gravy”! My grandmother, Rose, worked in one of the area factories that manufactured men’s pants, trousers, as they were called then, and did most of her grocery shopping on 9th St. before heading home. As she would say, “acquistare prodotti freschi, cucinare prodotti freschi”, meaning; buy fresh produce, cook fresh produce, and she did, every day. 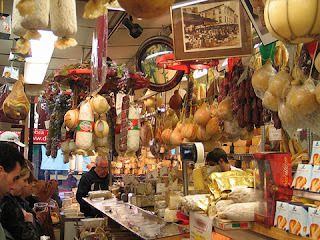 Grandmom was born in Palermo, Italy where marketing was done on a daily basis. And on a recent trip to Tuscany, I discovered that this is an age-old practice that continues there today. She was a rather large woman, my Grandmother, and could usually handle the bags of peppers, onions, eggplants and fresh sausage (when her budget allowed) in a canvas sack that she carried on the bus to New Jersey. On days that her stamina would exceed her 10-hour shifts, she would walk a little further down 9th St. and get fresh, crusty bread at Sarcones Bakery, which would eventually get stuffed with fried peppers, onions and eggplants. As one of the many grandchildren who would sometimes spend weekends with her, the best days for us would be when she would stop by Di Bruno’s Brothers Cheese Shop and buy a wedge of Locatelli Romano Cheese, a sharp form of parmesan that has a salty bite. She would grate it into small, fluffy mounds, and we would scramble over who would get to eat the last tiny piece that was too small for her to use. To this day, I can’t eat chicken soup without it. On Friday nights, she would roll out dough, spread on the gravy and load the top with the Locatelli before putting it in her oven. This was tomato pie, not pizza, and it was heaven. While it was baking, five, sometimes six, chattering cousins would roll the leftover dough into balls for her to fry and then roll in sugar. This was dinner and dessert at Grandmom’s and it just didn’t get any better. On Sunday’s, the day our parents would come to gather us up; we would stand at her apron and roll meatballs to go with the pasta, veal cutlets, sausage, and antipasti that would soon fill the dining room table. Chianti and orange soda were the beverages of choice. The meal would end when my mother and aunts would put out the cannolis and cookies from Isgro’s Bakery, along with an ample arrangement of fresh fruit; all bought in the Italian Market, carried in canvas, on a bus to New Jersey. It was the sites, the sounds, the smells of 9th street that brought these memories back to me on a recent winter day. The aroma of garlic sautéing in olive oil from restaurants, the warming scent of bread coming from bakeries, and the waft of hickory-filled smoke coming from wood burning in large metal drums along the street, helps keeps the atmosphere of this historic area in a magic type of time capsule. I can’t see it ever changing. As I walked back to my car, I saw an old women standing at the bus stop with a bag of groceries in each hand. She set them down momentarily to pull her collar up against the winter wind and I couldn't help but hope that there were grandchildren waiting for her to come home.